Hope you all had a good weekend, I know I did! I’ve been crazy busy lately (which is why I’ve been away from the blog lately), but I’ve got a fun review for ya today, brought to you by my mom! Enjoy! I love natural beauty products. In fact, for a year now I’ve been using coconut and almond oils on my face and have all but dispensed with store bought creams and lotions. Except when it comes to sunscreen. Because that is the one thing I won’t mess around with. When I was growing up sunscreen was not widely used, and since I’m fair-skinned, I ended up getting sunburned frequently. Now, after several small nevi (irregular moles) and one moderate atypical nevus have been removed from my arms and legs, I am more diligent than ever about wearing sunscreen. (Even in winter, I apply it to my face!) And I do visit my dermatologist once a year to make sure there are no changes to my skin. So I was really happy when Nora told me that we had been sent a natural, chemical-free sun block to review. Yep, I get excited about sunscreen. Block Island Organics is a family-owned suncare focused skin care line based out of Block Island, Rhode Island. They were kind enough to send us their new natural mineral (zinc only) SPF 30 sunscreen to test out. Made without parabens, sulfates, petrochemicals, phthalates, dyes, artificial fragrances and with a non-nano and vegan formula, I was really excited to try this! The first time I tried it was on a run. It was 11 AM and I was planning on being out an hour or so. It was very sunny, hot and humid and I since I knew it would be a tough run, I didn’t want to make things worse by forgetting to put on sunscreen. In most commercial sunscreens the active ingredient is usually the chemical Avobenzone, but in Block Island Suncare sunscreen the active ingredient is the mineral Zinc Oxide. That does make this brand go on a little whiter than most current commercial brands. (Also, I may have just put on a bit too much the first time, but I learned and in subsequent uses, just applied a little less.) Despite its being fragrance free, I thought it did have a little scent, but though it wasn’t the “traditional” sunscreen scent, it was subtle and not unpleasant. I’ve also tried it on my face, under my make-up. If you apply too much, you might look a little “ghostly” for a few minutes, but keep rubbing it in. It gets absorbed and it doesn’t hurt to put the excess on your hands to protect them, too. 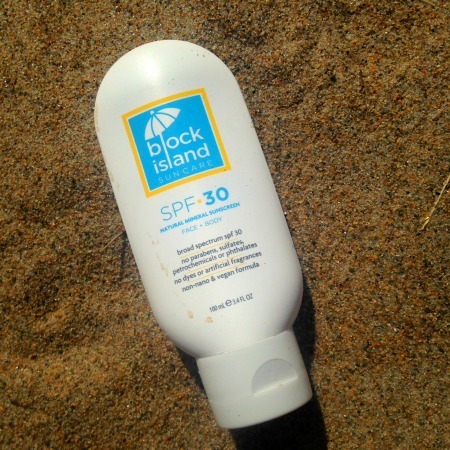 I found that with Block Island Suncare, I didn’t need to use any primer. A dab of sunscreen, followed by a little foundation, was all that was needed. And my foundation looked good all day! Though some sunscreens go on kind of greasy or oily, this one didn’t feel like that at all. Once it was rubbed in, my skin felt dry and smooth, and I completely forgot I was wearing it. I don’t know if this product comes in some kind of spray form, but honestly, at this point, I feel that’s the only drawback: you might have to get someone to help you put it on your back, so you don’t miss a spot! And who doesn’t like an excuse for a good backrub? Are you careful about sunscreen during the summer? 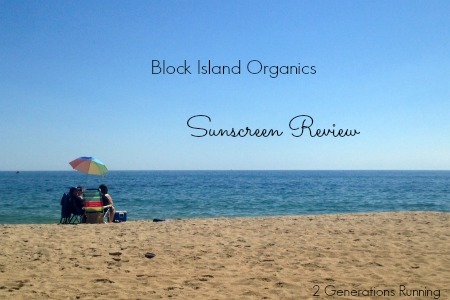 This entry was posted in Reviews and tagged Block Island Organics, New England, Rhode Island, Sunscreen Review. Bookmark the permalink. Hi, Marie. Where might this product be available?